As a child and a teenager, I wasn’t very keen on cooking. I thought of myself as “above” that in some way. I excelled at math and science and planned to have an important job and leave the cooking to other people. Truthfully, I never felt drawn to the homemaking arts at all, and I considered myself to be not very good at them. I lived in my head and had little time for wiping down counters, unloading dishwashers, or helping get dinner on the table. It all seemed unimportant and uninspiring. It’s funny how much things have changed for me. Though I did graduate with a biology degree, something inside me cried out against the math & science route I had been planning on. I ended up getting a Masters in counseling and then becoming a mom to three fascinating and fantastic children. In fact, most of my adult life has been spent cooking and cleaning. As a dreamy, oblivious child, I didn’t put it together that these are tasks few people are able to escape completely. They are the daily work of most lives. In a strange turn of events I have actually found the meat and meaning of life in the repetitive daily tasks…cooking in particular. I have found hope for changing the world, an outlet for creativity, a place to teach and connect with my children, a way to bring production back into the home, answers to my family’s health concerns, a deeper connection with creation, and even a new understanding of God. I’m really not exaggerating here – cooking has been all this and more, a beautiful gift in my life. Cooking in traditional ways, with raw ingredients while reaping health benefits and the simple joy of delicious foods has become part of every day of my life as a wife, mother, and entrepreneur. My kids could not help but see me cook, see the delight I take in it, and enjoy the fruits of my labor. I guess it was natural for them to want to join in the fun! My oldest wanted to help before he was even a year old. I realized then that watching some one cook (especially for a young child, but even for us adults, I think!) is like watching magic happen before your eyes. Interesting ingredients from different containers get mixed together, eggs completely transform, new enticing smells fill the air, and then something totally new and delicious that you can eat is created. Sitting in front of the oven and watching the bread bake can be better than watching a video on Netflix! All of this is so much better than toys or movies, and so – of course! – my kids wanted to be a part of it. Though all my children enjoy helping me cook, it is my daughter (my middle child) who has taken to it with the most passion and ease. She is eight years old and a better cook than many adults I know. She “gets it” at a level that I did not achieve for many years. In my childhood, I thought cooking was merely a matter of following directions – not worthy of my time or energy. As I have become a cook, I have learned that recipes are only a helpful starting place – adding in creativity, having an intuitive feel of ratios of different ingredients and what could substitute for ingredients you are low on or missing altogether – this begins the expertise and the fun of cooking. My daughter is getting that, and it makes my heart full and my eyes well up with tears. 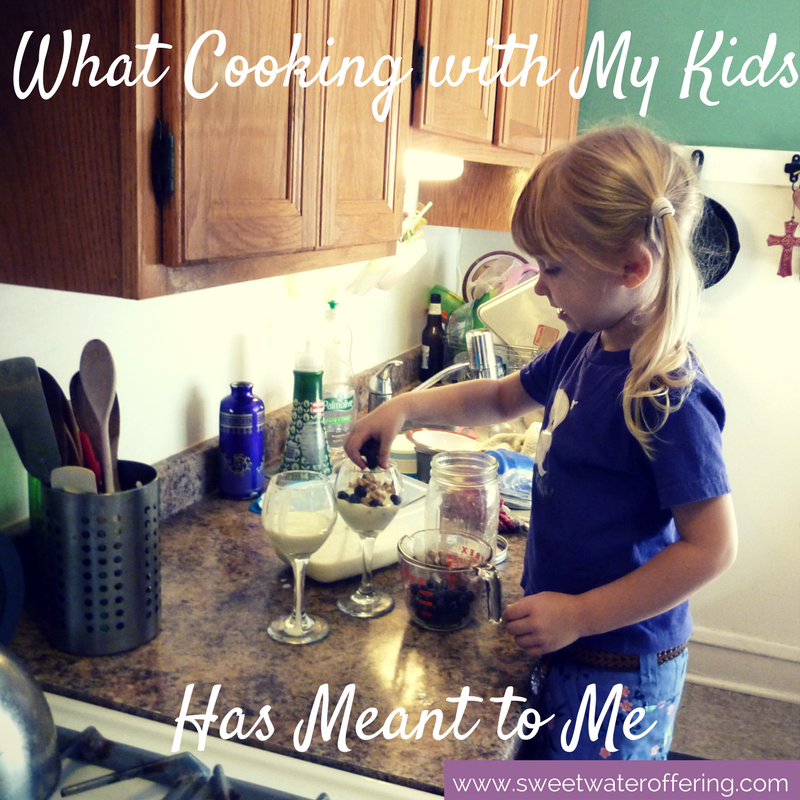 Cooking is a gift that I am passing on to my children. In a world full of technology, standardized tests, prescription medications, and pre-made foods, it is an invaluable gift of vibrant, real life that will empower them and nourish them. It’s absolutely worth a few messes and wasted ingredients, because there is so much more here than just pulling something together for lunch. Teaching my kids to cook is equipping them to provide for themselves, to be healthy, to truly experience and enjoy life, and to cooperate in creation itself! 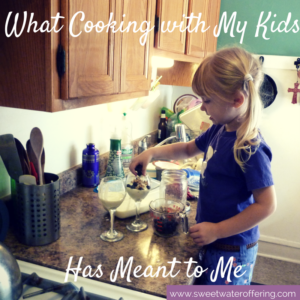 Want to experience the fun and meaning in cooking with your children? Sign up for Let’s Cook Together: A Healthy Cooking Class for Kids and Their Parents. Classes begin May 8th!